In the UK retiring ministers often find themselves with large collections of Christian books they no longer need. In many cases they do not have the space to store them. 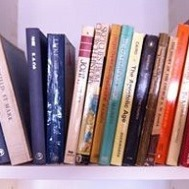 Likewise, avid readers of Christian books can have large collections on their book shelves. Understandably, they find it difficult to part with much-loved titles when downsizing, but the thought of their collections providing a new and valuable source of Biblical knowledge on the other side of the world considerably softens the blow of giving them away. Thanks to the generosity of many local Christians, Sovereign World Trust has been able to compile a sizable collection of second-hand titles across a range of themes. In 2016 one of the many emails we received was from the librarian of a newly formed college library in Melanesia. The library was struggling to find texts to match a range of Biblical teaching courses they were planning to deliver and had minimal resources to buy books. The librarian was able to identify some specific themes with which they needed help. Sovereign World Trust was able to respond to their requests by supplying a spreadsheet of titles from our pre-loved book collection. Amongst the many were Alistair McGrath's Introduction to Christian Theology; The New Bible Commentary for the Whole Bible; a Background to the New Testament; The New Bible Dictionary; Bob Gordon's books on the Foundations of Christian Living and the classic, Knowing God by James Packer. By carefully matching titles from our pre-loved book collection to the needs of the Melanesian library, we have been able to make a useful contribution to their collection and ensure that students will have immediate access to relevant information on a variety of themes. Providing books from our second-hand collection also offers valuable cost savings for the Trust, enabling us to direct funds to further mailings and the purchase of new titles - a win-win scenario.